WEST LAFAYETTE, Ind. — Styles from the mid-80s have not only gone out, but come back and gone out again, so Purdue University thinks it might be time to assess how sports mascot Purdue Pete could be made-over and updated for the 21st century. Although Pete is scheduled for an extreme makeover, traditionalists need not fret. Purdue has no plans to modify or change the Boilermaker Special. Retired versions of Purdue Pete, as well as other Purdue images such as the Boilermaker Special, are preserved through a university program that stores and licenses vintage university logos. The program, called The Vault, is operated through Collegiate Licensing Co. and works with 180 universities. Purdue plans to redesign the mascot with student input and unveil the new look later this year. This will be the mascot’s sixth makeover. Funds for the redesign will come from the operations budget of the Office of Trademarks and Licensing. These funds are self-sustaining and involve no state tax dollars or student fees. No redesigns are planned for Purdue’s official mascot, which is the Boilermaker Special, a replica of a Victorian-era locomotive. Pete got his start in 1940 as an advertising icon for the University Bookstore, and he continues in that role. He then appeared in other places in 1944, when editors of the Debris yearbook put an adapted Pete on each page. 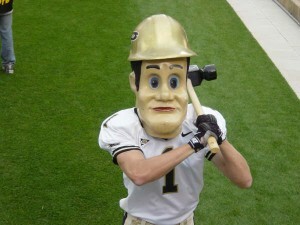 Purdue Pete debuted on the football field in 1956 with a papier-mâché head and a bit of padding. Today, Pete’s head is crafted from composite materials such as glass fibers and resin in an aviation technology lab. In addition to the head, the four students who portray Pete wear shoulder pads and carry a hammer.